CSIR- CLRI Notification is out. 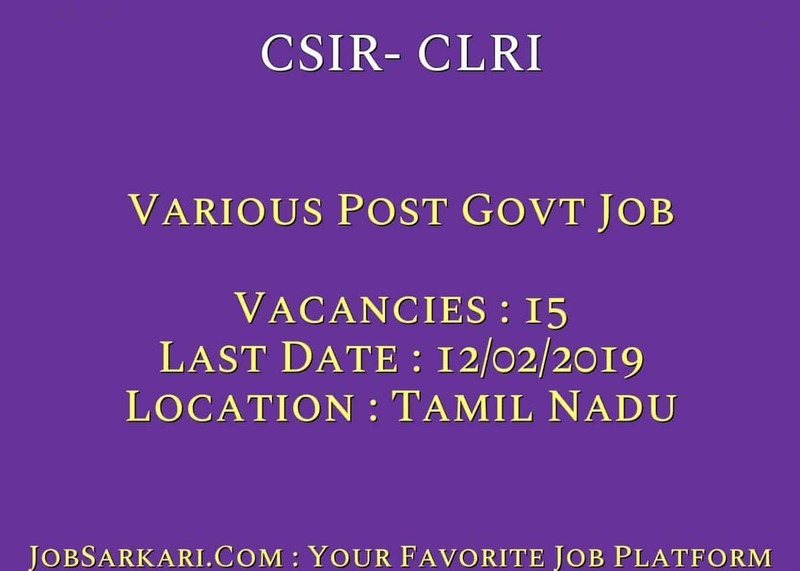 CSIR- CLRI is recruiting for 15 Various Post Govt Job Posts. You can check CSIR- CLRI - Council of Scientific & Industrial Research last date, download CSIR- CLRI notification, visit CSIR- CLRI official website and check other CSIR- CLRI Vacancy details.Complete Vacancy and recruitment Details about 15 Various Post Govt Job vacancies in CSIR- CLRI are provided below by JobSarkari.Com only for you. Date of Walk In Interview. 12/02/2019. Senior Research Fellow. Candidate Must Have Passed M.Sc in Chemistry/ Inorganic Chemistry/ Organic Chemistry/ Analytical Chemistry/ Applied Chemistry With 55% Marks. Having M.Tech in Nano Science And Nano Technology With 60% Marks. Max 32 Years. 01. Senior Research Fellow. Candidate Must Have Passed ME in Environmental Engineering/ Environmental Management With 60% Marks As Mentioned in Notification. Max 32 Years. 01. Junior Research Fellow. Candidate Must Have Passed ME/ M.Tech in Environmental Engineering/ Chemical Engineering/ Environmental Managment/ Thermal Engineering/ Energy Engineering/ Energy And Environmental Engineering With Bachelor Degree in Civil Engineering/ Mechanical Engineering/ Chemical Engineering With 55% Marks. Max 28 years. 01. Project Assistant Level-III. Candidate Must Have Passed B.E/ B.Tech With 55% Marks With 2 years Experience in Related Field. Max 35 Years. 01. Project Assistant Level-III. Candidate Must Have Passed B.Tech in Leather Technology With 55% Marks And Having 2 Years Experience in Related field. Max 35 Years. 01. Project Assistant Level II. Candidate Must Have Passed M.Sc in Biotechnology. Having B.Tech in Leather Technology With 55% Marks. Max 30 Years. 01. Project Assistant Level II. Candidate Must Have Passed Graduation Degree in Science/ Economics/ Statistics/ Computer Science/ Computer Application With 55% Marks. Max 30 Years. 04. Project Assistant Level II. Candidate Must Have Passed BE in Computer Science/ Electrical And Electronics Engineering/ Electronics And Communication Engineering With 55% Marks. Max 30 Years. 01. Project Assistant Level II. Candidate Must Have Passed M.Sc in Chemistry With 55% Marks. Max 30 Years. 02. Project Assistant Level II. Candidate Must Have Passed M.Sc in Chemistry/ Inorganic/ Organic/ Physical/ Analytical/ Applied Chemistry. Max 28 Years. 01. Project Assistant Level-III. Candidate Must Have Passed B.Tech in Leather Technology With 55% Marks. Max 35 Years. 01. 4. Candidate Need to go With Application Form to the Address Given Below with Required Documents on 12th February 2019. Q. What is the Last Date For CSIR- CLRI Various Post Govt Job Vacancy ? A. 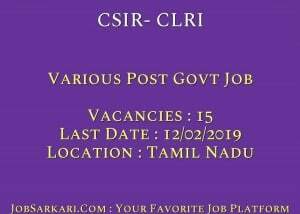 Last Date for CSIR- CLRI Various Post Govt Job Posts is 12/02/2019. Q. What is the Form Type of CSIR- CLRI Various Post Govt Job Recruitment ? A. The Form Type for CSIR- CLRI Various Post Govt Job Posts is Offline. Q. How many vacancies are available in Council of Scientific & Industrial Research Various Post Govt Job Posts ? A. There are about 15 Vacancies in Council of Scientific & Industrial Research Various Post Govt Job Posts. Q. What is the Full Form of CSIR- CLRI ? A. Full Form of CSIR- CLRI is Council of Scientific & Industrial Research .